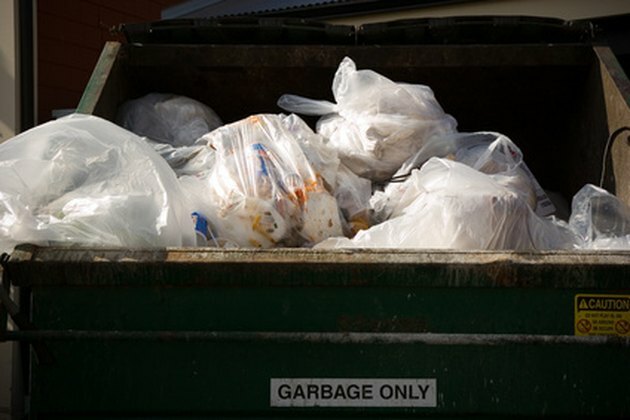 Garbage decomposes at wildly different rates. For instance, a banana peel takes about a month, while rubber takes about 70 years and a plastic holder can take 500 years. Landfills are dirty, smelly eyesores that are quickly becoming overcrowded and releasing methane gas into the atmosphere, while incineration releases carbon dioxide and other pollutants into the air. With the proper disposal methods, you can reduce your garbage impact while effectively removing it from your life. Reduce your garbage by disposing it by the most effective means. Sort your garbage into a few different bins. This can be done quickly by setting up a multi-storage bin in your kitchen so items can be sorted as they are disposed. Bring any garbage that can be reused, such as toys or clothing, to a secondhand store to be resold. Take recyclables such as glass, plastics and paper to a local recycling center. If your neighborhood has a recycling pick-up, leave it out in the front of your house in plastic bins. Don’t use plastic garbage bags as this only contributes to the waste. Turn food and garden waste into compost. You can do this with a simple compost pile, or speed things up with a compost bin filled with worms that will digest the trash and do the work for you. Once it’s completely composted, you can use it in your garden as a rich fertilizer. Collect any remaining garbage into a trash bag and place it into a garbage bin. Remember to seal the top so that animals won’t be able to get into it. Leave the bin in sight for garbage collectors on your pick up day.